The 45.7 metre motor yacht Skyfall II has been sold with Peter Thompson at Worth Avenue Yachts acting for the seller and SuperYachtsMonaco introducing the buyer. 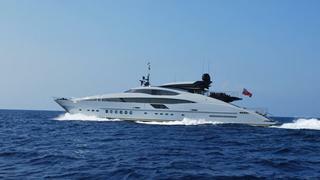 Originally named O'Khalila, she was built in aluminium by US superyacht yard Palmer Johnson and launched in 2007. She has two deck areas plus a raised pilothouse, which blends into an extensive open air deck. A modern interior by Italian design duo Nuvolari Lenard accommodates 12 guests in six cabins including a vast master suite with amazing views. MCA compliant, she has also been a popular charter yacht. A massive seven-month refit was completed in 2014 with no surface left untouched. She received new teak decks throughout, a reconfigured sun deck and an open sun deck lounge incorporating a Jacuzzi and wet bar, new audio/visual system, barbecue and open deck air-conditioning. Every inch of the interior was upgraded and refinished. Three Seakeeper gyros were installed to provide at-anchor stabilisation and Skyfall II still retains her Quantum fins.